F-Secure Internet Security 2011 is a quick, simple-to-use and comprehensive Internet security program which is designed to protect your computer against viruses, spyware, worms, identity thieves, harmful Web sites and etc – all without compromising your PC performance, offering ultimate protection to ensure your peace of mind while surfing the Internet. F-Secure Internet Security 2011 normally priced at €40.90 per 1-year single computer license. 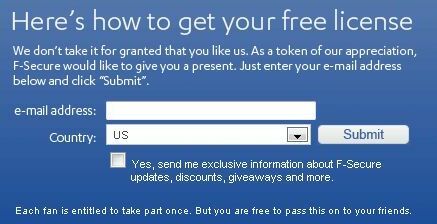 As part of F-Secure / Facebook giveaway promotion, the company is giving away 8,000 license keys of free 6 months F-Secure Internet Security 2011 to the interested Facebook users. 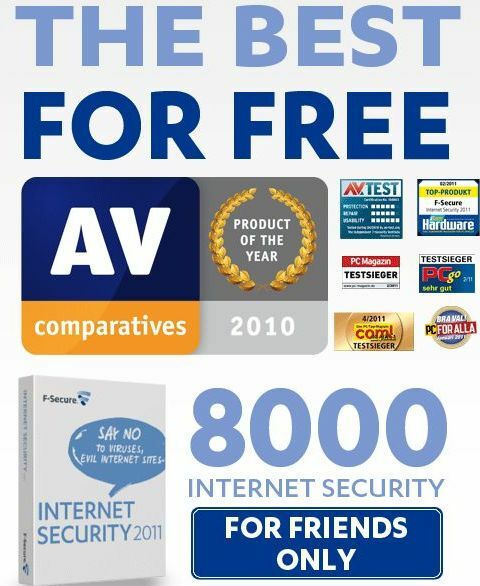 To grab a free 6-month subscription of F-Secure Internet Security 2011, visit F-Secure’s Facebook page and click the “Like” button to become a fans of F-Secure. Submit your email address and country and you will receive an email which contains a setup installer and free 6-month license serial key for F-Secure Internet Security 2011 shortly. F-Secure Internet Security 2011 is fully compatible with Microsoft Windows 7, XP and Windows Vista operating systems.